Are you looking for a more agile lifting solution in your garage? A vehicle scissor lift could be the solution you require. New for 2019, Tyre Bay Direct are pleased to offer a solution to garages requiring scissor lifts. Calling upon the renowned American brand, Atlas Auto Equipment, we are able to provide a more flexible approach to your vehicle lifting requirements. Scissor vehicle lifts can help to increase your productivity and workshop efficiency whilst taking up less space than a traditional 2 or 4 post vehicle lift. They are ideal for a wide range of important service and repair jobs. We have planned new releases to expand our scissor lift line across 2019. Sign up to our newsletter to be the first to hear when new products drop. 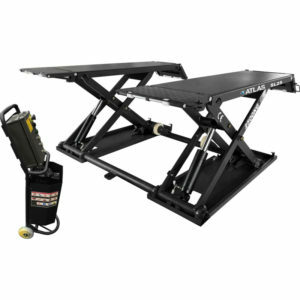 Pre-order the brand new Atlas SL25 Scissor Lift today! A car scissor lift allows great access for engineers/ mechanics doing a range of work around the wheels including inspecting areas like the tyres or brakes. The scissor lift is an all-around accessibility machine with no posts to get in the way. This is a piece of equipment designed and manufactured in such a way as to allow you to drive on quickly and lift a vehicle hassle free. As with all the equipment we supply here at Tyre Bay Direct, we won't supply a scissor lift range if we are not first happy it is durable, high quality and fit for purpose in your garage. These are products specifically manufactured for longevity and efficiency. Lift the effectiveness of your garage services - Scissor the Answer! Vehicle Lifts are an imperative part of the profitability within your garage, especially when you are dealing with mechanical repairs and tyre services. Investing in a simple, yet robust scissor lift like those stocked by Tyre Bay Direct could help boost your revenue. They are often also viewed as a more affordable solution when looking to increase the lifting capacity in your garage. Talk to our team today to ensure you are investing in equipment that can help your services run smoother. Easy to function scissor lifts, that are portable and aid efficiency, can help you run through multiple repairs quickly and ensure happy customers. Which Scissor Lift is best for your garage? As we expand the selection of products in this range throughout 2019, one thing is for sure. Our experts will know the right lifting solution for your garage and speak impartially about what that is! It can be difficult to identify which scissor lift is best for your garage services if a scissor lift is capable at all. Our team are trained to understand your workshop by taking the time to talk to you. We endeavour to offer you a viable solution, whether it is one we currently offer or plan to offer soon.